Ryoma is made from freshly squeezed cane juice according to agricultural rum traditions, and aged for seven years in oak barrels imparting its legendary flavours and mellow. Its rich, soft texture and typical aromas of vanilla and caramel, characteristic of aged rums, reminds of the West Indies aromas combined to exotic flavours evocative of Japanese sake. The result is attractive and original. Ryoma 7 Years Old is a Japanese expression that rum lovers will enjoy discovering. 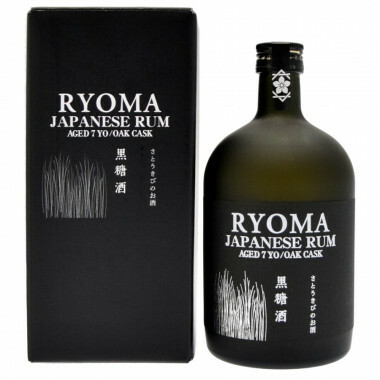 This rum celebrates Ryoma Sakamoto, born in Tosa (now Kochi) on November 1836. He is a prominent figure of the patriots that led to the Meiji revolution. "Ryoma" takes its name from the legend of a god named Kirin, with the head of a dragon and the body of a horse. Ryoma refers also to an incredibly fast horse able to travel 3900 km in one day. The day before his birth, Ryoma's mother dreamt of a dragon rising to heaven. The child she gave birth to had a mane on the back, which explains his name. In addition to being an expert swordsman in the style of Hokushin Itto, he had a gun, a rare fact at the time. He is also famous for having marketed the first Japanese goods, and was a pioneer in many areas. He was assassinated at age 33, a year before the Meiji revolution. Strangely, it took place on the same day as his birth, on the 15th of November. Today, he is still very popular along with Oda Nobunana as a historical hero who gave rise to a new Japanese era. Kikusui was formerly a rum distillery. It is located in Kuroshio, a village east of the Kochi region, south of Japan on Shikoku Island. Kikusui is known to be one of the oldest sugarcane producers in the archipelago, and even one of the biggest at the beginning of the 20th century. The distillery took advantage of its sugarcane production and launched a new rum: Ryoma, a unique Japanese rum inspired from traditional foreign techniques. Nose: surprising and complex with fruity and floral notes accompanied by classic aromas of vanilla, ginger and caramel. Palate: rich and clean, intense but very balanced. It confirms the aromas of the nose.